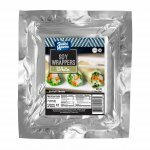 Sushi Maven Orange Soy Wraps [SMOSW] - $15.99 : SushiMaven.com, Your Source For Everything Sushi! Soy Wraps are made from the highest quality soy protein, without the cholesterol and saturated fat. Created as an alternative to seaweed, it is useful and fun in many ways! 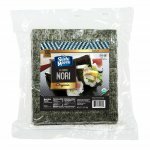 Soy wraps can be used for sandwich wraps, dessert crepes and of course sushi rolls for a beautiful and colorful touch! Its available in 7 bright colors making the options endless! Ingredients: Egg White, Whole Egg, Soy Protein, Sorbitol, Glycerin, Yellow 5, Red 40.